Offense makes the best defense; this is the strategy the brawlers has finally decided on to get Jake back. Ren also wants to go rescue his former teammates (minus Sid), and so they split up. 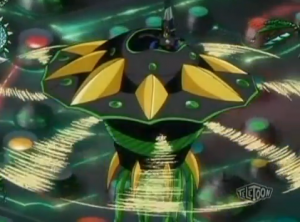 In this episode, Marucho and Shun battle against Gill and Airzel, and we are reminded again just how powerful Krakix can be. We also get to see how Dragonoid Colossus attacks with his battle gears (powerful attacks but I think he moves so slow in the air). 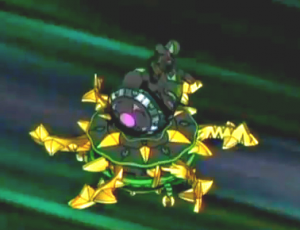 And we also get another good look at the Bakugan Mobile Assault Hurrix. There's not much information about it, only that it was first shown in episode 12 when the Gundalians were searching for the Element. This entry was posted on Monday, November 15th, 2010 at 8:11 am and is filed under Bakugan Gundalian Invaders, Bakugan Tv Show.You can follow any responses to this entry through the RSS 2.0 feed. Both comments and pings are currently closed. finaly something that hasn’t been officialy anounced! why does blitz dragonoid not look like the toy blitz dragonoid? season 4? isn’t this season 4? and why does blitz drago wings (the show) not look like the toys wings? 1. this is season 3, and 2. its anothe alternate form for the show like hades. are you being sarcastic? and what are you even talking about? and if it is gonna be released in gi, why have we only seen it ms packaging? what is ms and gi? No offence Dan, but seriously, enough questions! You don’t have to apologize, i’m just sayin’ that to many questions can get a bit annoying! ok lets reveiw—ms=Mechtanium Surge,nv=New vestroia,gi=Gundalian invaders,sa=super assault/special attack,ma=mobile assault. Q ok and hydraboid 2 things 1. thanks and 2. how did you make that thing before your name?